It's Fall Y'all! Can you believe that it's fall already? I've been busy decorating my home with fall colors and getting into the spirit of season. That means making all things pumpkin spice and even my very own apple cider. 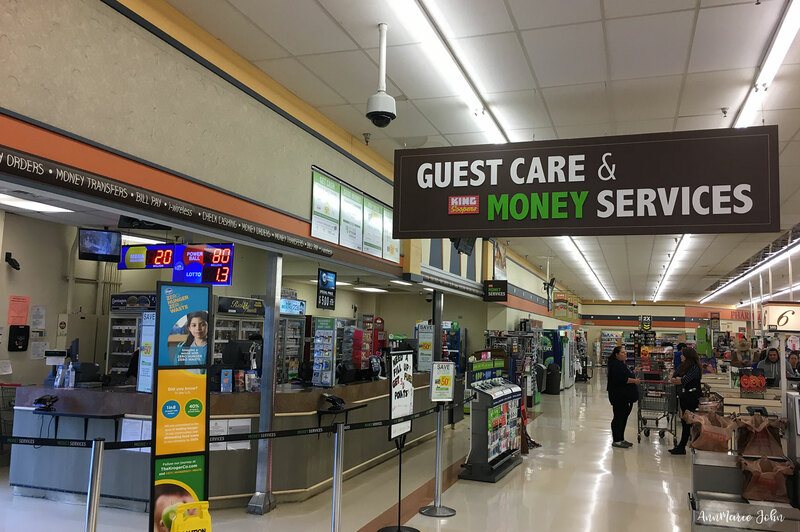 With a family of six, shopping can get expensive, especially grocery shopping and I try and save in as many ways as possible, that's why I love shopping at my local King Soopers, a Kroger family store. This is a sponsored post written by me on behalf of Money Services. All opinions are 100% mine. When you have a big family as I do, shopping can be a chore. My children all are different, not just in looks and behavior, but also in their eating habits. Madison loves milk, Mikael loves juice, Kyle loves anything meat related, while Kristal doesn't eat meat at all. I go shopping weekly for my family and one of the easiest way for me to save is by using my King Soopers loyalty card. Not only do they have amazing sales, but I load my coupons onto my card without even having to take physical coupons to the store with me. It's just one of the ways I save. When you have kids who can eat you out of house and home, you want to save as much money as you can, while getting value for whatever you do spend. Shopping at King Soopers is always a treat and having my King Soopers loyalty card with me is a must. It is very easy to sign Up for a card and best of all it's totally free. Each time I shop I not only save on my grocery trip, but I also earn fuel reward points as well which in turn saves me money on gas. With the price of gas sky-rocketing, every bit of savings help. Another incentive to sign up for the loyalty card is that you get to save up to $0.50 on “Product/Service” at Money Services with your card. However, your discount may vary based on your location. 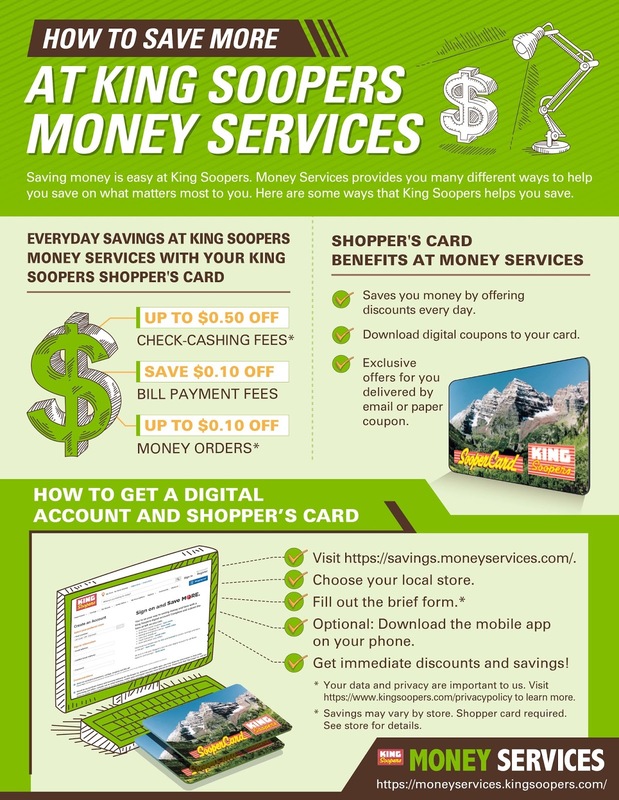 King Soopers Money Services allows me to save on check and debit card cashing, bill payments and money orders. I'm all about one stop shopping since I personally hate going from store to store, especially if I have Madison with me. I love being able to pay my bills, such as my water and electricity bill, purchasing a money order and buying groceries all at the same time, which is another reason I just love King Soopers. Find a location to cash a check and find a location to pay your bills. 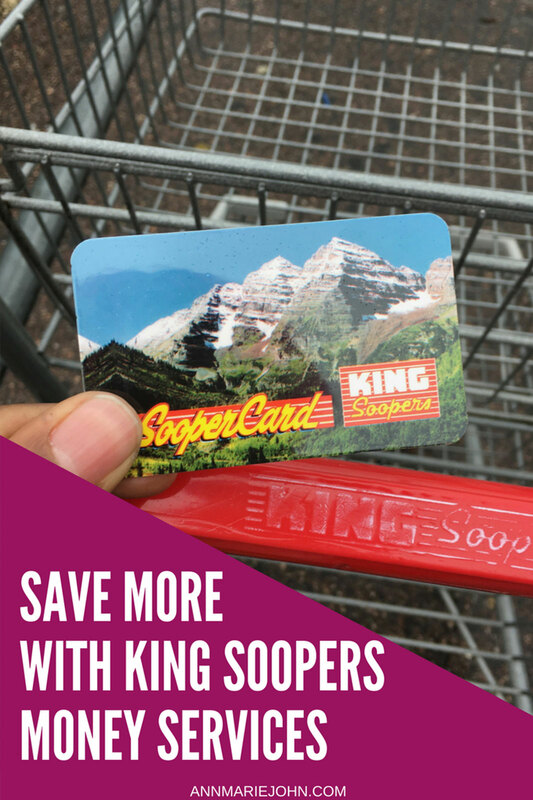 With all the benefits of signing up for a King Soopers loyalty card, why wouldn't you? So what are the ways you can save? So sign up for your loyalty card and start saving today! Be sure also to enter below for your chance to win a $50 Kroger Giftcard which you can use at any Kroger family store. Leave a comment for your chance to win. That sounds super cool! I love it when my favorite stores offer extra services that save me time. I need to see if we have any King Soopers in our area. While you may not have a King Soopers, you may have another Kroger store in your area. They all carry the same services. Grocery store loyalty cards are the best. But I have to say, your King Soopers card sounds even better than the average card! This seems awesome! We don't have these in my area, but I wish we did! I love saving money and always try to save as much as possible, especially on groceries. We don't have a King Soopers here in North Carolina, but we do have a Lowes Foods that implements all the things your grocery store does. Thanks for all the savings tips, especially loading coupons onto your card. I always always always forget to do that. I shop at Krogers all the time. Is it the same loyalty program? I certainly do love all the rewards they offer! Digital coupons are my favorite. I've never heard of this store before. And I don't think we have them in Florida. It sounds like a wonderful store though where you can save lots of money! We need to sign up for a loyalty card! I love that you can load coupons onto the card instead of carrying around coupons to the store. This definitely be more convenient for my grocery trips. It's usually me and my husband and he tries his best to stick to my diet, for support I think. It's good to know that we can save on groceries here. I love sticking to my budget because that means we get to travel more. I had not heard of King Scoopers before, I am going to have to check out if there is anything like this in my area related to the same network! I love saving anywhere I can. We don't have King Soopers, but we do have Kroger and I love using their card for grocery savings. I love the idea of putting coupons directly on your card since I always forget my paper coupons at home. We have Ralphs supermarket where I live which I think is also a Krogers affiliate. I love the name King Soopers though. That's a lot more fun. It's always great to find ways to save. I don't know if the stores near me have this service. We don't have a King Soopers here in Ohio. I spend so much at the grocery store that I seek out ways to save. Thanks for the tips. That is sooper helpful! Nothing beats perks from the places we love to shop. I would love to check out a King Sooper store. Those perks sounds awesome! We don't have a King Shoppers out here. IT would be nice to have all the the perks laid out for me like this for a place we do have. This is awesome! I love finding ways to save especially when holidays are approaching! This is awesome! I love finding ways to save money especially when holidays are approaching! It is times like these that I wish we had a Kroger Store here are our local area, because this service sounds awesome! It's great to know that King Sooper's is offering these services! I am in love with this idea! How fun. I don't have a King Sooper in my area but now I wish there was! I don't think we have a King Sooper any place near me. I think having a Sooper Card is fantastic! What a great way to earn points/cash back and get more stuff done all in one place. Great info on King Soopers. Anything that helps you save on money! That's really amazing! I wish we also have a store like King Sooper Store! I always sign-up for loyalty cards at my most frequented stores. They help you save so much money and give you access to special discounts. We don't have a King Soopers where I lived but it sounds like a nice place to save money on groceries. You know, I don't think I've been to a Kroger. Not even sure if there is one around. Grocery shopping does tend to get tedious when you have a big family. Having programs like this one that offer incentives for frequently shopping make it so much more bearable. I'm not familiar with King Soopers. So helpful though that they have all of these services available to you in addition to the great savings on your grocery items! All those little savings in both time and money add up to a lot over time. This sounds like a really great service! There isn't a King Soopers near me, but this is good info to know for sure. We don't have a King Soopers near us, but this sounds like such a great program! Maybe there's something similar in my area! This sounds so great! I had not heard of this before, but I definitely need to look into it!! King Soopers sounds like one of the better money services out there. If I'm ever in need, I will be sure to check them out. These look like some great benefits. It is so rare to find a good loyalty program for the stores one shops at. King Soopers manages to do a lot with their program I think. I totally feel for you. Back when all my kids (5) lived at home, shopping could be so stressful, and finding meals that everyone loved was nearly impossible. (To this day, I think that there are only a handful.) It sounds like this would be a very handy service. King Soopers is the best! When I lived in Colorado it was my go-to grocery store and we still head there first every time I visit. I will have to tell my CO relatives and friends about all these cool services. This looks like a great convenient service to use while you're already out doing your weekly shopping! We have Kroger and I love it. Our local store closed, but they built a new big store I go to. This sounds like a great store with a fab rewards scheme! Plus it’s habdy to be able to do so many things in just one place. There isn't a King Soopers nearby where I live, but it would be nice to have a loyalty card that did all of that. It wouldn't definitely help simplify things!